London has many such museums, in the centre and in outlying boroughs, housed in historic houses, libraries, and municipal buildings. One such commendable discovery is the Islington Museum. It is not only home to a permanent exhibition about local history but changing exhibitions with a local link. A recent one explored Holloway Prison, a former borough institution, unfortunately now closed amidst much controversy. (Holloway Prison was not only the largest women’s prison in the United Kingdom but also all of Western Europe.) The current exhibition, Raids, Rations and Rifles – Islington during the First World War is particularly relevant as Armistice Day, Remembrance Day and Remembrance Sunday fall on the same date in 2018, and, in fact, November 11, 2018 is the centenary of the armistice when the fighting in World War I ceased. Remembering is all the more poignant because of these coincidences. What we learn is locally distinctive, not the prime ‘stuff’ of the capital’s Imperial War Museum, or the National Army Museum, where political strategy, weaponry and military logistics are major topics in a national and international context. Moreover, what is local may inspire us to find out more about its significance in a wider historical and social context. Perhaps our food banks, for example, could be developed to resemble the National Kitchens that were established by the British government during World War I in light of the shortage of food, especially imported food? They were intended to feed people inexpensively and economically. People of all ages and from all walks of life would eat in what were restaurants for “ordinary people in ordinary circumstances”. While standing on line, they would be served by volunteer workers and then eat their meals while sitting at long communal tables. The fare was meant to be nourishing, certainly not adventurous; food wastage during food preparation was unforgivable. 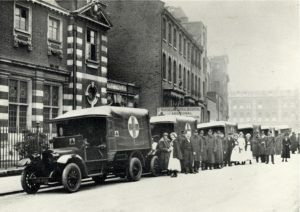 Two years earlier a fair was held at the market site to raise money for the Allied Wounded Soldiers Relief Fund, a charity that helped to establish hospitals and provided money for ambulances. Two of the organisers were Harry Gordon Selfridge of the department store fame and the novelist Arnold Bennett. Among the sale items were 2,220 tons of coal and a champion British bulldog. At Mrs Arnold Bennett’s stall one could find books autographed by GK Chesterton, Sir Arthur Conan Doyle and Joseph Conrad. There were 25,000 people attending and £30,000 was raised, which in our time is the equivalent of £1.5 million. The Whitbread Brewery in Chiswell Street was proud that some of its handsome and muscly draught horses, over one hundred – the Whitbread Shires – were commandeered for service. In common with other horses commandeered, they laboured behind the lines. Horses could move easily through mud, transporting medical staff, the wounded, supplies and artillery on wagons. Sadly, none of the Whitbread Shire horses ever returned. Disease, poor nourishment and hygiene, dire weather conditions, and the strain of the relentless work rather than gunfire caused many fatalities. In 1991, the Clerkenwell stables closed and the remaining horses were sent to a permanent home in Paddock Wood in Kent. Incidentally, many thousands of American horses were shipped to Britain to help with the war effort. Dove Brothers, a large, well respected construction firm in Cloudesley Place, known for its civil engineering projects, shops, offices, Anglican churches and non-conformist chapels, turned its production over to producing wooden propeller blades. (Metal ones were manufactured after the war.) Both men and women worked at the site doing what was a highly skilled job. Workers had to ensure that the angles of the blade were shaped and balanced exactly such that the planes would work most efficiently. Municipal buildings were used in unusual ways to help the war effort. In 1917, The Bank of England took over the vacant St. Luke’s Asylum for the Mentally Ill in Old Street so that it could be used as printing works; war bonds were among its publications. The first such bond was printed by King George V during a Royal visit to the works in December 1917. Selling war bonds to the population was a means of raising money for the war effort; good patriots should show their support by buying war bonds. The borough was also home to anti-war movements. In 1916 and 1917 unsympathetic and violent protesters disrupted meetings for pacifists at the Brotherhood Church in Southgate Road. The most eventful clash was after a meeting attended by 250 delegates, including the philosopher, historian and pacifist Bertrand Russell. It was sparked by the nearly 8,000 who gathered outside. In spite of police presence, delegates were physically assaulted and much church furniture was destroyed. Several months later the church was set alight and so damaged that no more meetings could be held there. Elsewhere in the borough the North London Herald League held mass anti-war meetings, one of which was addressed by the suffragette Sylvia Pankhurst. These meetings were regularly attacked by the members of the Anti-German Union who referred to the protestors as “peace cranks”. One local notable resident and peace activist was Baron Archibald Fenner Brockway (1888–1988). He became a Labour MP for Leyton East in London, and years later the MP for Eton and Slough. Brockway spent time in the local Pentonville Prison for refusing to pay a fine for distributing anti-conscription leaflets. Later Brockway became a founder member of the movements War on Want and the Campaign for Nuclear Disarmament. Islington is proud of the fact that the oldest regiment in the British Army, The Honourable Artillery Company (HAC), incorporated by Royal Charter in 1537 by King Henry VIII, was located in the part of City Road that lies in the borough. Its battalions greatly contributed to the war effort. Many of its members received military awards. Two notable members were the actors Nigel Bruce, known for his portrayal of Dr Watson with Basil Rathbone as Sherlock Holmes in a series of Hollywood films, and John Laurie, well known for his character Private Frazer in the Dad’s Armytelevision comedy. In the glass topped table displays in the Islington Museum are a variety of war memorabilia, including one soldier’s photo album. Soldiers were banned from taking photographs after 1915 in order to stop the British from seeing horrific images of war. This serving photographer smuggled his film in a hollowed out shaving stick. There are medals and cap badges on display and also a newsletter from the interment camp for 750 German and Austrian internees in Cornwallis Road. You can view a charming film montage showing various local patriotic events taking place during the war such as a garden party for the wounded. Quite a few of the people look very dour! 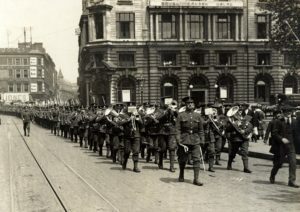 The images above are of the Honourable Artillery Company on a recruitment march in Finsbury Square, 1914, and the last troops leaving the Great Northern Hospital annex at North Library, Manor Gardens. Credit: Islington Local History Centre. This article first appeared in The American Hour Blog, http://www.theamericanhour.com/?blog=.